38 years ago I spent a great deal of money on a good hi-fi system. At its heart was a QUAD 33/303 pre-amp and power amplifier combination. I have used it every day since then. It has never been serviced or repaired. It simply works, and it sounds as good as it ever did. Which for me is great. I’m still playing the same music on it. But it’s a measly 30 watt amp. You can break glass and dislodge substantial chunks of masonry with its sound output, but the spec doesn’t lie. Shortly after I bought it, I saw Japanese-made 120 watt amplifiers at half the price. OK, they didn’t sound anywhere near as good, but just think of all that power! I listened to a few. Cranked up, they didn’t seem to be any louder than the old QUAD (Little Feat’s Rock ‘n’ Roll Doctor is the benchmark). Then I discovered the reason. The QUAD’s output was measured as “the closest approach to the original sound” — that is, the clearest and loudest you could go before any distortion was audible. That was 30 watts. The Japanese, on the other hand, took their 30 watt amplifiers and figured that as they were stereo, the 30 watts should be 60 watts. And forget fidelity of sound, just crank it up as far as it will go. So the 60 watts became 120 watts — there was no volume control as such, simply a distortion intensifier. Faced with a 30 watt amp and a 120 watt amp, which would you buy? Right. That’s why the average IQ is 100. Now something similar is happening with cameras. fotoLibra only accepts 8 bit images. The next step up is 16 bit, but few commercial printers can use 16 bit files, and JPEGs can’t be saved as 16 bit. So we ask for 8 bit images to be uploaded. Well yes it does, in the same way that those old Japanese amps pumped out 120 watts. The marketing department of the camera manufacturers have reasoned that if a digital image is a combination of a Red, a Green and a Blue channel, each of those is 8 bits, therefore 8 + 8 + 8 = 24. And which would you rather buy? A 24 bit camera or an 8 bit camera? Right. You will almost certainly have an 8 bit camera. Unless of course you have an expensive 48 bit camera, in which case you actually have a 16 bit camera — lovely, but you’ll have to convert the images to 8 bit to upload them to fotoLibra. Going back to those amps for a moment, the Beatles performed using 30 watt Vox AC 30 amps. 30 watts is plenty loud enough for most needs, although Vox did build them special 100 watt amps for their performance out of doors in front of 55,000 fans at Shea Stadium. Nobody could hear them anyway. If you made any attempt to contact anyone at fotoLibra between 17:00 GMT on Saturday February 21st and 09:40 GMT on Monday February 23rd, please resend your message as our email server was down and your message will not have been received. Apologies, but these things happen. There’s a radical new version of the useful fotoLibra DND application released today. It has all the functionality of the previous easy drag ‘n’ drop upload facility, but with the added bonus of checking every file to ensure it meets fotoLibra’s stringent Submission Guidelines. Up till now, we allowed you to upload anything to fotoLibra, because only after we’d received it and looked at it could we tell if the file met our standards. 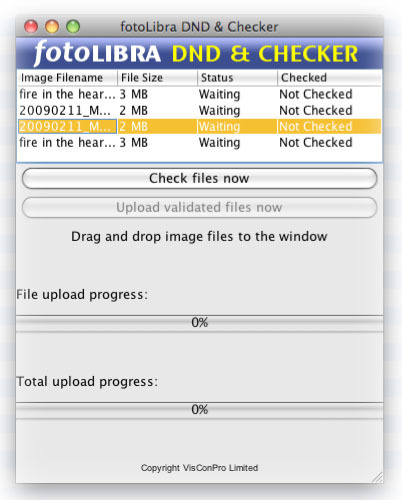 Now DND 2.1 allows fotoLibra members to check their files before going through the long and disheartening process of uploading files and being told an hour later that they have been rejected because they’re not 300 ppi (the most common cause). We hope you like it. Please let us know what you think. We believe it is DND2.0 with a big new feature. We know that the version number has a psychological impact on people, but as software engineers we follow the rule: major version number increases if and only if a fundamental and structural evolution has occurred. We have not re-designed it. We have updated and extended the earlier great job. Which is why we only recommend increasing what we refer to as the “minor” version number. If you believe it’s got to be called 3.0, we will rebuild it. We have spent some time on packaging it, most of the time compiling and building the core software (with support for JPEG, colour, etc) because the binaries provided are not suitable for the average user (and that’s the reason why it is much bigger now). Faced with such logic (they are technical folk, after all) I capitulated and agreed that it’s to be called fotoLibra DND & Checker Version 2.1. Search for Spring Fair on Wikipedia however, and you only get the Johns Hopkins Spring Fair, which attracts some 25,000 visitors to a provincial American university. Birmingham’s Spring Fair is massive, with thousands of exhibitors and hundreds of thousands of visitors, yet it doesn’t rate a ripple on the internet. Its own web site is a desperate selling tool, bereft of any real information, simply data. How old is it? Who runs it? How long has it been going? Is it a direct descendant of those mediaeval Guild fairs? What’s it really for? I went once, and it was huge and unfocussed. Companies selling dolls jostled with calendar publishers, fabric samples, wedding cakes, lawnmowers, accountancy firms, potters, balloons, jam, jewellery (this year carbon neutral, so no diamonds then), greetings cards and anything else you can think of. Perhaps it’s an exhibition for trades that don’t have their own exhibitions? Some greetings card manufacturers use photographs. We found out who they were. We telephoned them in advance. We created lightboxes and lightboxes of images we thought might appeal to them. We sent them to them. We called them again. We emailed to arrange meetings. Not a twitter of interest. Yet fotoLibra sells well, and repeatedly, to a few select greetings card companies. But not to all of them. So tomorrow two of us are going to the Spring Fair with a hit list of 25 greetings card companies. And we shall lay waste among them. If only we knew what the Spring Fair really meant.